Indian investors have long had a fondness for hotel investments in the US. Given the cultural affinity for the same, it is natural for Indians seeking an EB-5 Investor Visa to seek the same via a hospitality investment. Thus, we will evaluate the merits of investing in a hospitality project to satisfy the EB5 investment requirements. You can confirm these priorities for yourself by simply asking “would you pay $450,000 to 475,000 for family Green Cards?” For 99% of Indians, the answer is no. Thus, no amount of interest is more important than the return of the original investment amount (the $500,000). Having confirmed the investment priority, there is no corresponding reward for taking additional investment risk. Remember that risk and reward are always linked. Higher returns always come with higher risk, and in the US that relationship is almost linear. A very conservative project that is successful will provide a green card and return of $510,000. A very risky EB-5 project that is successful will provide a green card and return of $600,000. Same outcome for conservative and risky projects. What rational investor would risk their families’ future and spend 6 to 8 years of their lives chasing an extra $90,000 return? The answer is none, so we conclude that any Indian investor who falls for high returns simply must not understand the associated risk. Note that well designed projects in the US can easily obtain capital domestically, there is no need to go overseas. So why do projects and developers seek capital off shore using the EB-5 program? Fundamentally there are two reasons for this, and they differ greatly. First possible reason would be the project is of marginal quality and either cannot attract capital at reasonable cost in the US or simply cannot attract domestic capital at all. Capital markets in the US are flush today so if a project is unable to attract suitable capital in today’s market that is a big Red Flag. 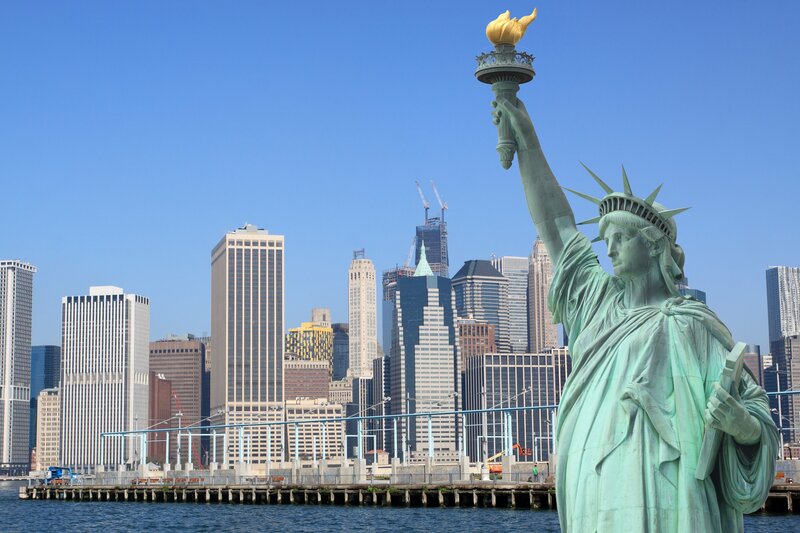 Second potential reason is that the project is of suitable quality to attract capital in the US but sees the EB-5 program as an approach to lower its overall cost of capital and thereby improve the financial return for project owners. Essentially a hedge or arbitrage opportunity to obtain capital at a lower than market cost by offering a different benefit (the Green Card). This would be an appropriate reason for utilizing EB-5 as a capital source. Raising capital with the EB-5 program is not easy and takes a large investment, experience and dedication to be successful. Many developers are attracted to the idea of lower capital cost but are not prepared or willing to make the long-term commitment to overseas marketing and serving unique EB-5 investors/immigrants for 5+ years. When evaluating a Regional Center and its project this is an important thing to keep in mind. Of course, the project and its owners are receiving the benefit of lower cost of capital, but the Regional Center should demonstrate that they have the commitment and resources to serve the EB-5 client with the true investment return – the US immigration process. Now let’s define risk as it pertains to the EB-5 project. Risk #1 is about obtaining your Green Card. What has to happen for this to be successful? Most real estate-based projects are designed to create indirect jobs resulting from construction spending. USCIS accepts derivative indirect job creation in Regional Center-sponsored projects. Hence, if the developer spends the money and builds the facility, the job creation requirement has been satisfied. Simply, construct the building and job creation is done. 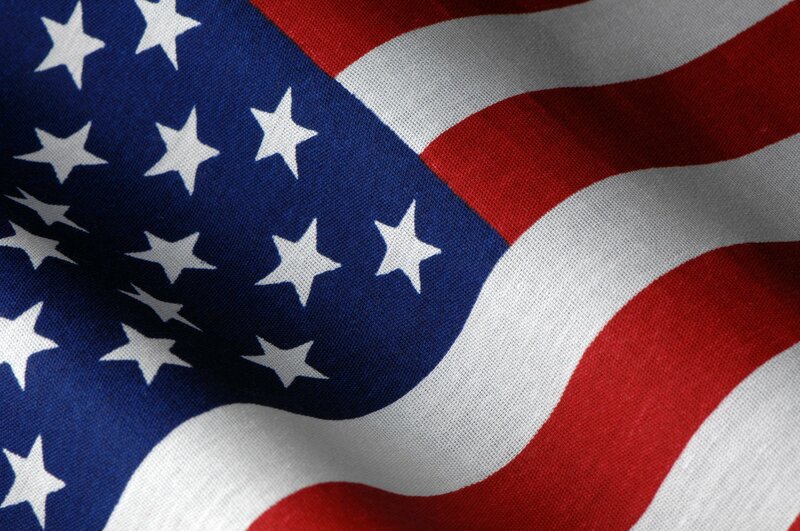 Now the second EB-5 ROI is the safe return of your investment. This one is harder to evaluate for the EB-5 investor. You must ask “What is the exit strategy?”. Once this building is constructed and put into service, how will that turn into cash necessary to return my $500,000? For most commercial real estate projects, the answer is either a sale or a refinancing of the property. Plus, for that to be successful for the EB-5 investor, the sale or refinancing must be at the property valuation that was projected in the business plan. If at the time when the project is ready to sell or refinance the economy is in a down cycle, or even worse in a recession, property valuations will be lower and capital markets for purchase or financing will be tighter. That could mean that even if the property can be sold or refinanced, it could happen at a lower valuation and there might not be enough funds to return all or perhaps any of the EB-5 money. None of us can predict the economy years into the future with any confidence. We know that there are the routine up and down cycles of every economy, we just don’t know exactly when these turns will occur and how sharp or severe they might be. Then of course there are so many things completely out of our control than can turn an economy sharply such as trade wars, terrorist activity, governmental matters (Brexit, government coups, etc.) and more. Lots to think about. Now let’s look at commercial property and think of the different categories or ‘asset classes’ as they are often called in the US. Some asset class valuations will be more volatile than others. That is, some will experience higher peaks in an up market and more downward pressure in a declining market. 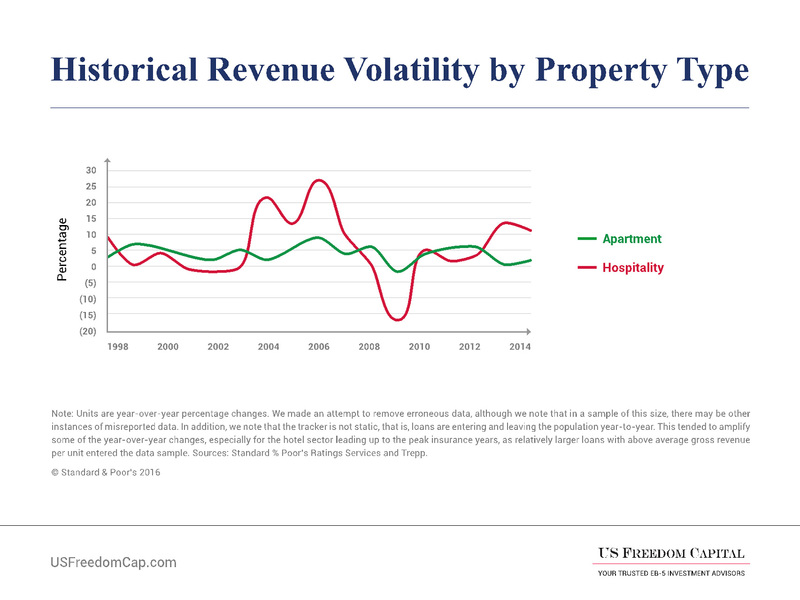 The hotel industry as an asset class is highly cyclical. 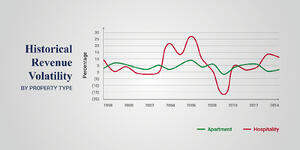 Hotel valuations can be quite volatile and are highly dependent on the strength or weakness of the economy. When the economy is expanding rapidly, people need to travel for business activities. Similarly, there will be more leisure trips as consumers have more money to spend. On the other hand, travel is one of the first few items businesses and consumers will cut in an economic downturn. The same is true for personal trips. Even if trips are required, businesses and consumers will often choose less expensive options. Hotel operators tend to invest and build more hotels during the peak of the economic cycle. By the time these developments reach completion, the economy may reach a downturn. The hotel industry depends also on the prosperity of the travel industry. Besides domestic tourists, the U.S. also receives about 37.6 million visitors from overseas per year (based on 2016 stats). The number of tourists from overseas can decline due to various factors such as global macroeconomic conditions. In addition, the recent trade conflicts between the U.S. and China will likely also negatively impact the number of Chinese tourists visiting the nation. To the point, there were about 3 million Chinese visitors in 2017. In fact, since the announcement of tariff earlier in 2018, bookings for visitors to the U.S. from China declined by 8.4% year over year. In contrast, non-discretionary asset classes (that is, real estate required for a modern human existence) tends to be much less volatile. 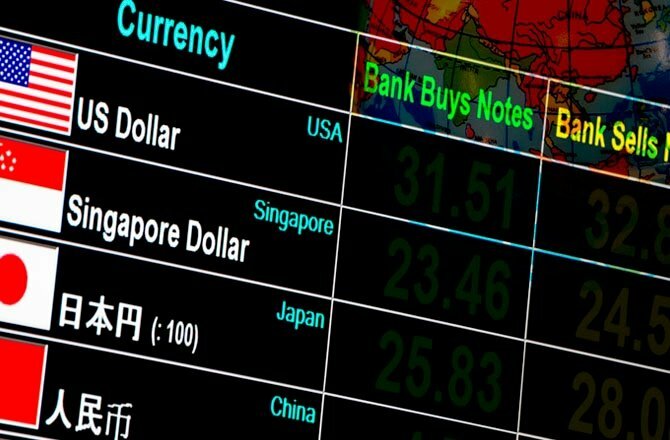 Asset classes such as housing, medical and education do have variability due to current economic conditions, as individuals and firms make spending decisions based on their current mindset, however, they are still spending. For-lease apartment construction is a good example. In regions that experience trending population growth, people need places to live regardless of economic activity. Since the EB-5 investor did not receive corresponding return for accepting additional project risk, the asset class of your EB-5 investment should be the safest choice available. Hotels do not pass that test when compared with for-lease apartments. In summary, an EB-5 investor needs to look out 5, 7 or 10 years to understand no one knows the economic environment in which a real estate exit will occur. Rather than betting their return of principal on an asset class that requires an economic boom, the EB-5 investor should be conservative in choosing an asset class which performs in good times and bad. For-lease apartments fill that need while hotels do not.